Ever since seeing the neon lite streets of Los Angeles circa 2019 via Blade Runner. I've wanted one of these bad boys. My need for one of these was increased when reading Bladezone.com (a Blade Runner fan site) and finding out that at the launch of the Blade Runner Final Cut 25th Anniversary Edition After Party. Guests were given a gift pack that included a Blade Runner branded LED umbrella. Now via the miracle of the "future" and the Internet we can all own buy one for £17 ($24.99) from ThinkGeek.com . 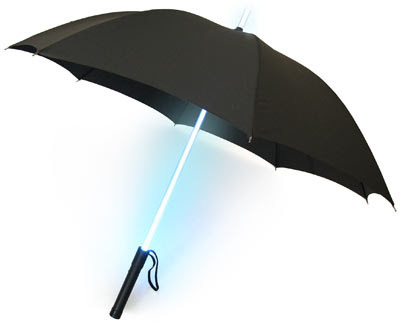 The umbrellas come Jedi Blue and Sith Red. In the pre-apocalyptic future, the air will be so thick, it will be dark in the middle of the day. Coupled with the almost constant rain, you'll need to find a way to stay dry, and light your way to the noodle shop down the street. Even if you don't live in a quasi-futuristic Los Angeles, and aren't a Blade Runner, you can still have the coolest umbrella on the street. With a push of a button, the shaft lights up, illuminating you and your path. Now, even in the darkest of nights, you're a lot more visible to the cars on the street, making your long walk home through the rain a lot safer. Want a Blade Runner LED Umbrella?